Top 10 European Countries to Visit on Your Next Europe Trip! Home » Top Holiday Destinations » Europe Travel Blog » 10 countries to visit on your next Europe trip! 10 countries to visit on your next Europe trip! By now there’s probably not one person who hasn’t spent at least a year’s worth of life lusting after Europe and it’s culture. Bollywood has, of course, added tons towards to that feeling with Zindagi Na Milegi Dobara, Queen, DDLJ and Dil Chahta Hai! Let me give you the whole picture with bunches of trivia to alleviate your #Europe trip #Wanderlust with. This is no stunner on the list here. No one kids themselves when it comes to France or it’s synonym, Paris. I guess being the most touristy spot on the planet comes with certain perks. Instead of stringing words together, let me just put out a tiny of all the names that represent France: Eiffel Tower, French Riviera, Champagne, Chanel, Jazz, Cannes, Dior, Provence, Louvre, Bordeaux, Oysters, Crepes, Baguette, Souffles, Creme Brulee, Macaroons, duck confit, all things Flambeed.. well after food enters this line-up, you know there’s no end to it! Our picks: Rochefort Bridge, The Camargue Salt Flats, Gorges du Verdon, Nice, Strasbourg, Mont Saint-Michel. 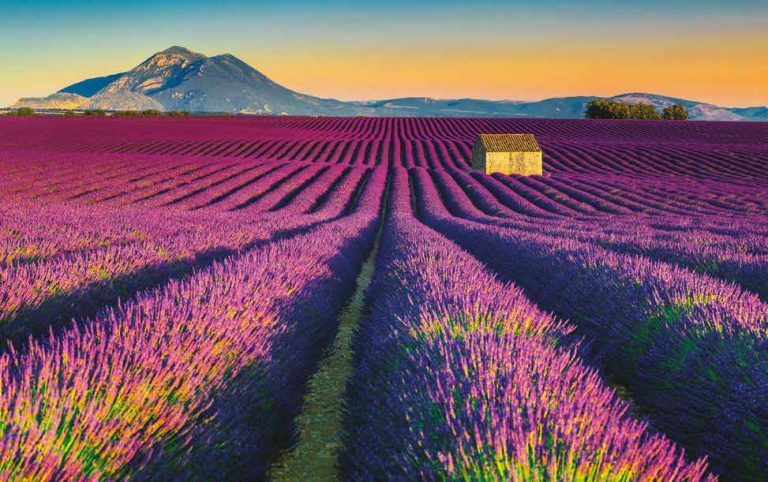 Book your trip to France right now! The image of eating steaming hot Fondue along with a Raclette sitting in a wooden cabin surrounded by the Swiss Alps beckons me with all its might. It is the stuff of dreams. Wait.. is this a food blog? I guess by now there’s no point in going back. But I assure you, this is about all the general aspects of these countries. Not just foo0d! Switzerland is ruled by the all-majestic, their Royal Highnesses, the snowy Alps. Chocolates, cheeses, trains and valley roads are just the foot-soldiers of this beautiful postcard-panoramic empire. 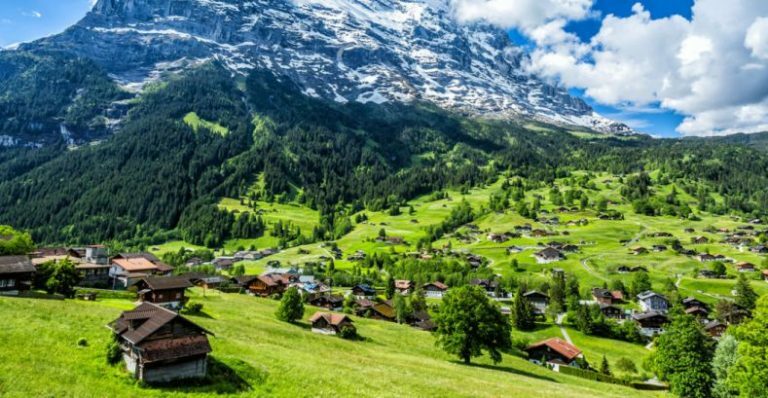 Book your trip to Switzerland right now! ‘The Hills are alive with the sound of music’. If there’s any good description of the country, it’s this one. Add a little history and a lot of prodigious castles to it may be. 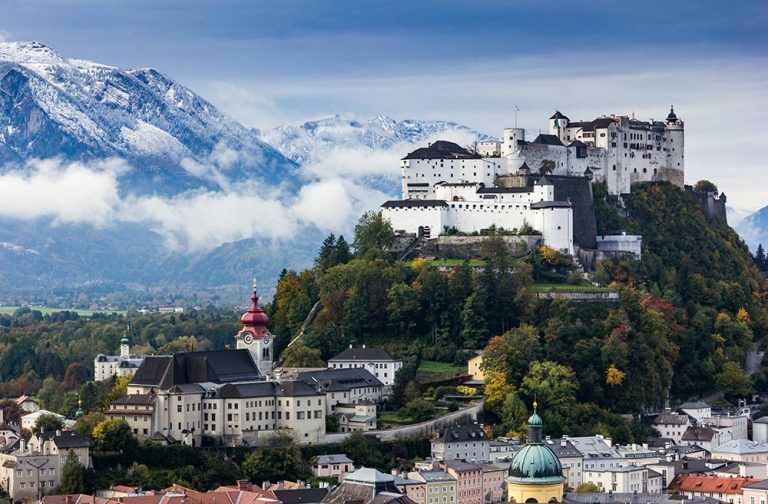 The Salzburg Fortress in the above picture is a testimony to that fact. The Austrian Alps in the background do great justice too. The milky skies and crystal clear lakes have inspired many artforms in many of the greats! Even Beethoven and Mozart have fallen artistic preys to this poetic land. Book your trip to Austria right now! Germany is a land with a little bit of everything in place. Busy streets with all the vehicles in the world will have snow drifting in the middle of it. Serene countryside with calm windmills gliding will have levels of industries you cannot even imagine. Technically the best of all and flowing with beer at every street corner, Germany is a unique country to travel to. To not say anything of the Oktoberfest!! Architecture is so good that all of Munich, Frankfurt, Berlin and Hamburg are lined up with man-made landscapes. 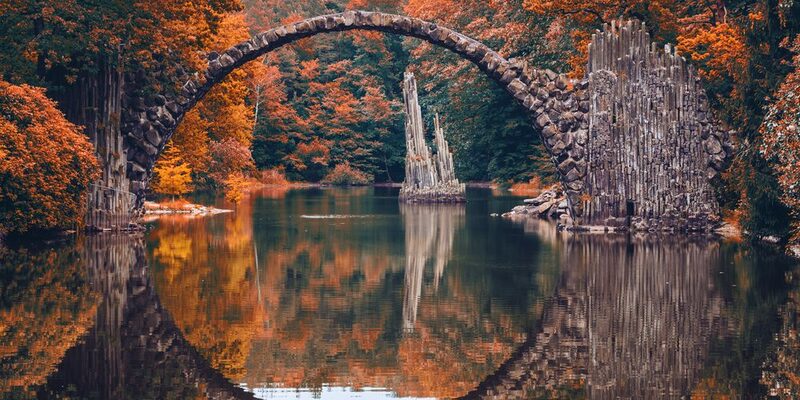 The black forest(not the pastry) and Rhine Valley, Devil’s Bridge(picture) and the Bavarian Alps region help too. Our picks: Lake Constance, Zugspitze, Dresden, Cologne, Berlin wall, Neuschwanstein Castle. 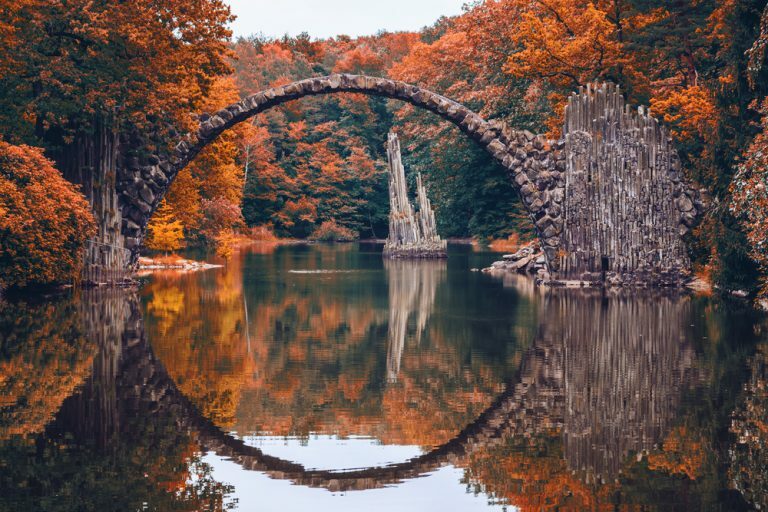 Book your trip to Germany right now! What is there for me to say about this country that hasn’t already been said? It is an island associated with Norse Mythology and the Gods in it. There’s just so much ice, more ice and even more ice in it. For an Arctic region, there’s a surprisingly good amount of green pastures. 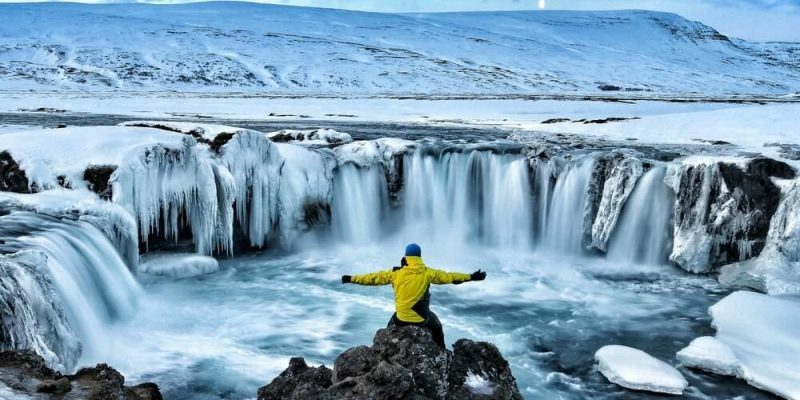 It is the ‘Land of Ice and Fire’, for the contrasting numbers of glaciers and volcanic activities. Okay. That’s all with Iceland’s mundanity. Now let me get to the magical part of it: The Final Act. Fairies visit every night. Warm springs erupt in the most unexpected places. Sand isn’t the shade that it should be, it’s a meteorite black. Waterfalls and glaciers freeze, defreeze and skim. The sun rises in the night. 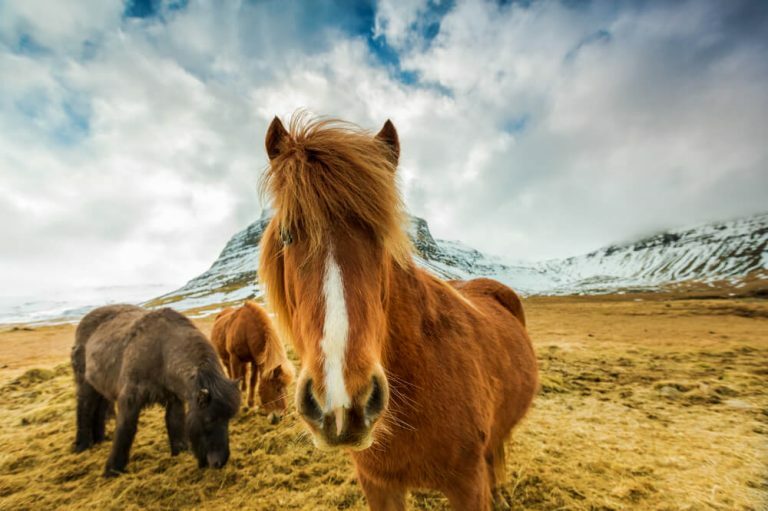 Even the horses don an adorable winter-look! Our picks: Thorsmork, Reyjnisfjara, Vik, Reykjavik, Akureyri, Skogafoss, Kirkufell, Blue Lagoon, Gullfoss. Any Europe trip should start here, as a rightful rite of passage. All the Georgian castles and Scottish countryside pastures bring out all the Jane Austen-style dreams and begin cravings for Harry Potter tours. After all the ferries and abbey tours, when you sit down on a random park bench to finish your banoffee pie, everything about the place will make you feel like you’re the lead role of this travel sitcom; and that’s an awesome thing to feel. 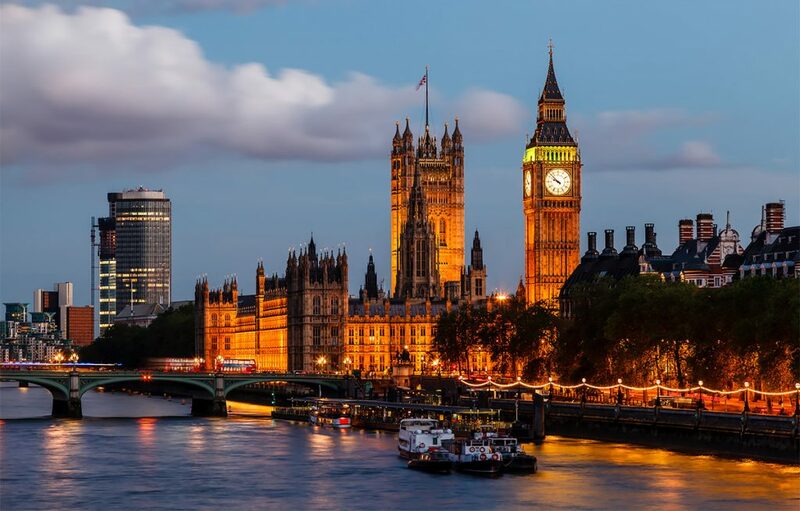 Book your trip to UK right now! Wouldn’t you stepping into a flight right away if tell you there are 170000 tonnes of chocolate being produced in Belgium every year? Chocolate comes in all forms, even as a famous statue of a boy. It doesn’t stop there. There’s always yummy Belgian waffles to turn to when you’re panting from having eaten all the chocolate. Quick fact: Belgium is where ‘French Fries’ were born! Summing up, leave your diet behind when you board the flight. Again, this is not a food blog! 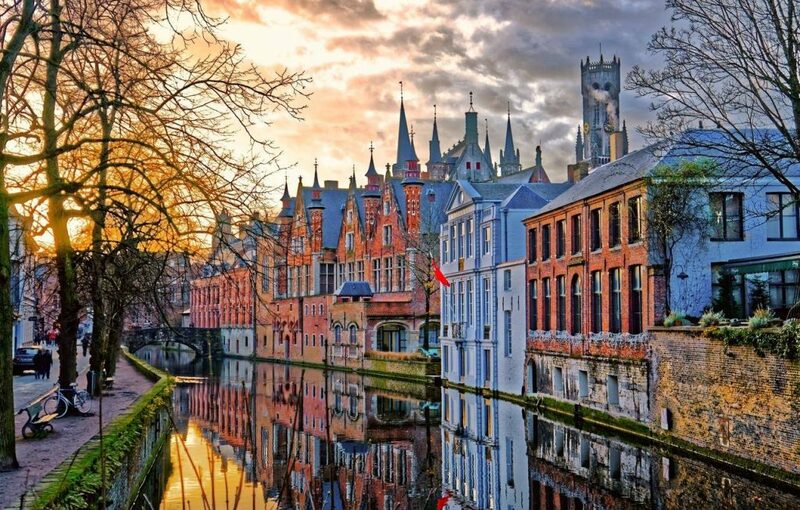 Apart from these, this country could be visited just for the beautiful street vibes and medieval architecture. Rated as one of the happiest countries in the world (for various reasons! ), the Netherlands has been attracting tourists for ages. The factors that contributed to this conclusion could be the candid rules of the country, the cafe food tours, the nice people that live here, the Gondolas, or just the fact that it is home to Amsterdam and Rotterdam. Another beautiful aspect of this region is the Tulip gardens and the Tulip Museum. 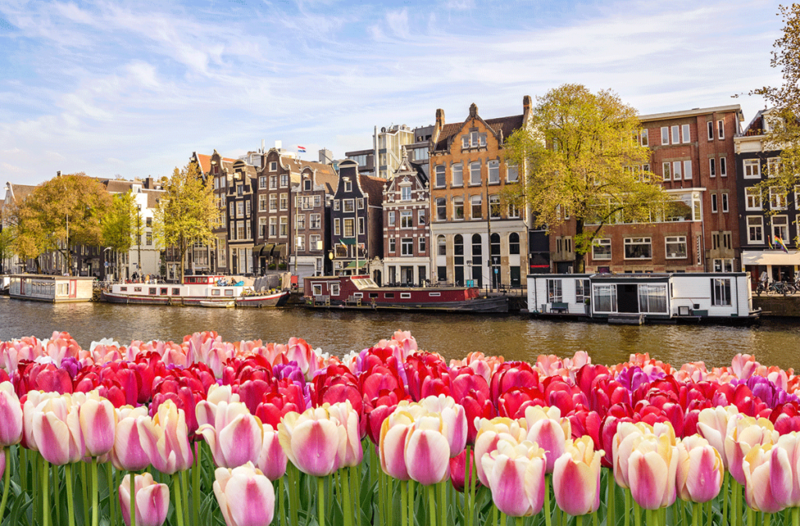 Any location framed by a bunch of Tulips is super-awesome, right? This is where it all started! For the Romans, for the historians, for the tourists, and for pasta! History swarms in every avenue and love are sprayed at regular intervals by cupids. From sunny beaches to tomato sauce-smelling Tuscan valleys, this country never fails to amaze. Take any city, it will be a fashion lover’s sweetheart. Florence is where at least a hundred artists became what they now are. Rome saw the beginning, zenith and downfall of centuries worth of empires. Milan is where the luxury seekers got to. Bologna is where the pasta and wine enthusiasts go. Verona is where Romeo and Juliet lived. Naples is where the romantics go to retire. Venice, well what do have to say about that? Our picks: Mount Etna, Dolomites, Lagos di Braies, Tuscany, Gran Paradiso, Cinque Terre, Amalfi Coast, Scala dei Turchi, Castelluccio di Norcia. 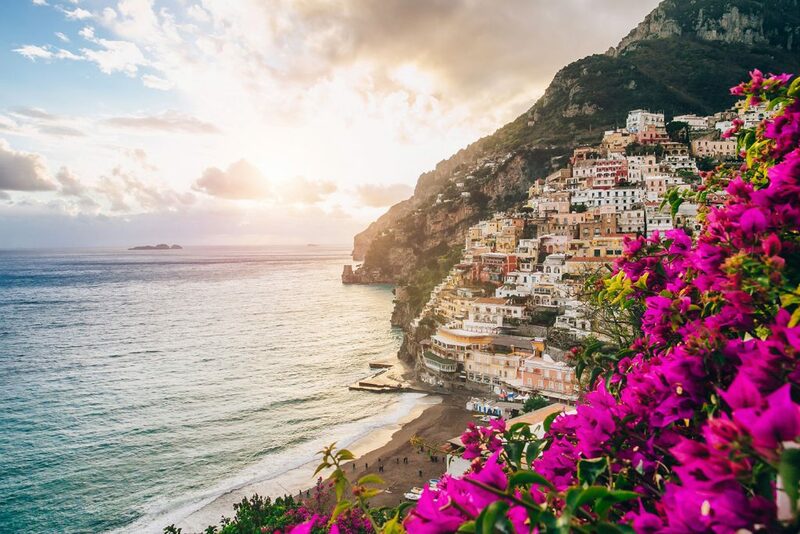 Book your trip to Italy right now! When you think of Art-Nouvelle aka super-chic European architecture, you think Prague. Trendy, just-in-style European cities don’t come better than this. The country, on the other hand, is full of innate rural beauty. Moon springs, chocolate-woods and its own share of snowy mountains. The cities and towns of the country host one of the best food tours of the continent. Do not miss out on the stunning desserts like Kolache, Trdelnik and a classical Czech meal of bread dumplings and herring served with hot Goulash. 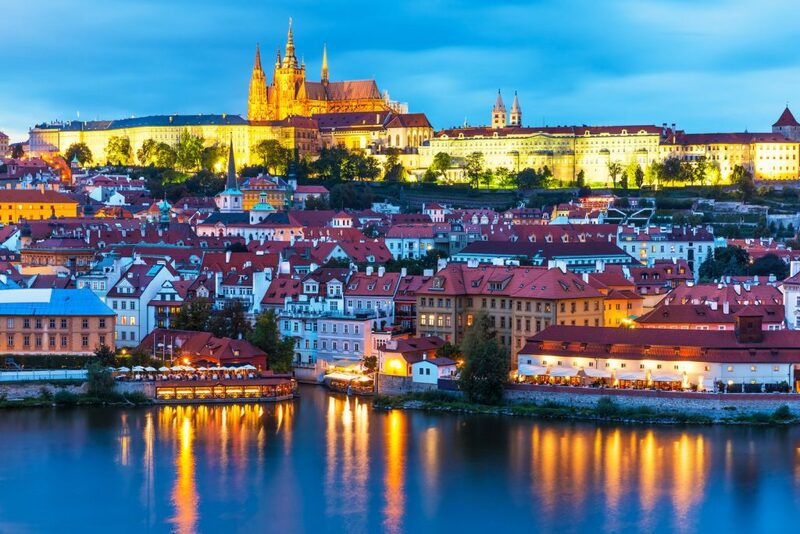 Visit the Czech Republic on your next Europe trip definitely. Excited, charged and breathless are you? Aim straight for the stars above Europe. Book a trip or choose from these itineraries.